Extend Function: data logging, USB communication, RS232 commnunication, Bluetooth communication, SD card record, USB disk record, LAN communication. ・4 2/1 high performance Bench-type DMM, Liquid crystal display. 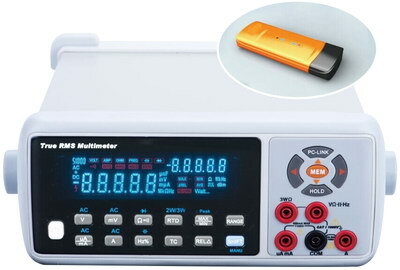 ・It can be used to measure DC and AC Voltage, DC and AC current, Resistance, Capacitance, Hz, hFE, Diodes and Continuity. ・The max. voltage measuring can up to 1000V DC or AC peak value. 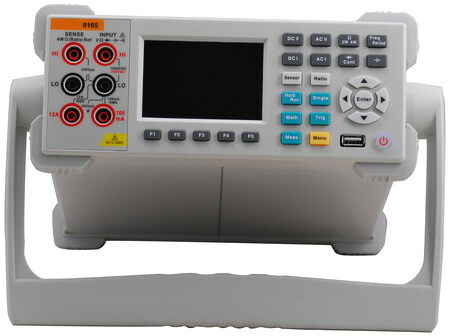 Resolution can be 10u V, and current measuring can up to 20A, it also has the function of polarity auto-change, backlight displaying and directly reading. ・For AC measuring, it is performed by high accuracy true RMS, has the feature of width measuring and to get accurate rms for AC flow of any wave shape.